A new video of Saddam Hussein’s corpse. With gaping neck wound was posted on the Internet early yesterday, the second leaked release of clandestine pictures from the former leader’s handing and its aftermath. The video, which appeared to have been taken with a camera phone, pans up the shrouded body of the former leader from the feet. It apparently was taken shortly after Saddam was hanged and placed on a gurney. He was hanged shortly before down on Dec 30, 2006. As the panning shot reaches the head region, the white shroud is pulled back and reveals Saddam’s head and neck. His head is unnaturally twisted at a 90 degree angle to his right. It shows a gaping bloody wound, circular in shape, about an inch below his jaw line on the left side of his neck. His left cheek is marked with red blotches, and there is blood on the shroud where it covered his head. The newest video leak was likely to increase the angry reaction over the way the execution was carried out. There already has been a global outcry about the undignified manner in which the Shiite-dominated government hanged Saddam, a Sunni. The 27-second video was posted on an Iraqi news Web site that is known to support Saddam’s outlawed Baath Party. It was the second clandestine video to have leaked, the first showing Saddam being taunted in his final moments. That clandestine video showed the former leader dropping through the gallows floor as he offered chanted prayers. It ends with his dead body swinging at the end of a rope. The hanging video was in sharp contrast with an official video that was broadcast not long after Saddam’s execution which showed him standing silently on the gallows as the noose was put around his neck. The official video was muted. 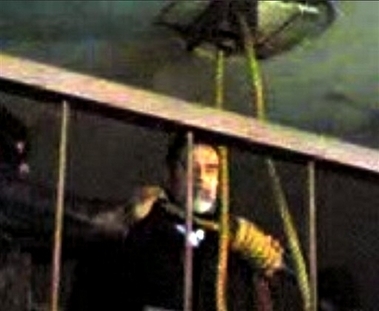 The leaked hanging video, however, was shot from the floor of the gallows chamber, looking up at Saddam. Voices could be heard taunting him with cries of “Muqtada, Muqtada, Muqtada,” referring to radical anti-American cleric Muqtada al-Sadr, the leader of the Shiite Mahdi Army militia and a key support of Prime Minister Nouri al-Maliki. The prime minister pushed for Saddam to be executed before the end of 2006 and just four days after the death sentence was upheld by the appeals court. U.S. official sought to delay the execution. This entry was posted on Wednesday, January 10th, 2007 at 4:43 pm	and is filed under Interesting Stuff. You can leave a response, or trackback from your own site. 2 Responses to "New video of Saddam Hussein’s corpse"